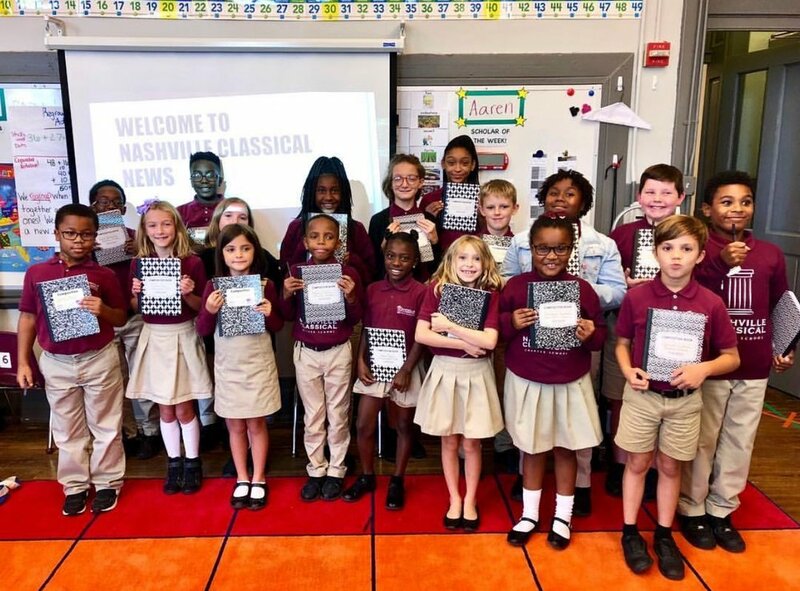 Nashville Classical News is a student-run print and digital newspaper at Nashville Classical Charter School. Scholar reporters in grades 3-5 write on topics ranging from investigations into cafeteria food to the secret lives of teachers. You can follow their stories on Instagram @nashvilleclassicalnews. For this story, they interviewed a collection of staff and parents to better understand how schools can increase parent involvement. Q: Addison Hickman, (third grade): How do you balance running a business, being a mom, and volunteering? A: Shani Dowell: Well, it’s reasonably easy to balance the parenting and the volunteering now that both my kids are here at the same school. It is confusing for them sometimes — I have to remind them that I don’t work at the school! When it comes to being on the board, the hardest thing is to remember to look at the school from the perspective of what’s best for all kids, not just mine. Q: Canaan Jones (fifth grade): Is it hard to help out at the school? A: Kelly Pruitt: It depends on the job! It’s great to feel like I’m helping and an honor to be trusted — particularly when trusted with a job I don’t feel qualified to do. But I’ve gained so much from just that — stretching myself to achieve on behalf of the scholars and faculty. Mrs. Pruitt added that she and her fellows members of the CFC volunteer on a weekly basis by making copies for teachers and on an annual basis by hosting family events like the Day of the Dead Celebration or a roller skating night. Q: Mia Adams (fifth grade): What does the school do to involve parents? A: Ms. Saiyed: We know that parent involvement is key to success for our scholars and have set up lots of ways that they can help. Members of the CFC are at the school almost every day, whether it’s supporting teachers with prepping their materials for the following week, serving as tour guides for prospective parents, or being chaperones on field trips. Our goal is to find ways for all families to meaningfully impact our school. Ms. Saiyed went on to tell us that the school has also leaned on the opinion and advice of parents when there is a new project or a tough problem. She explained that the school even decided to update its hours and dismissal time, based on feedback from parents and making sure we understood how the change could affect families — both positively and negatively. Q: Jaxson Harris (fourth grade): How can our school and other schools get more families actively involved? A: Mrs. Dowell: The biggest driver of family involvement was the enthusiasm of the kids themselves. When you take a paper home from school, you need to be sure to show it to your families and tell them that you’re excited for the event and that you’d love for them to be involved! We — as a school, a board, or a family committee — also need to make sure that families always know that they’re valued. A: Mrs. Pruitt: When we were setting up the CFC we were also intentional about how we named it. We are aware that many of our scholars do not necessarily have a parent as their main caregiver and so we wanted to make sure that those aunties, grandparents or guardians know that this was a place for them to be involved too. A: Mrs. Dowell: We send an email or text to every parent that has signed up every Friday. It asks whether they are mainly satisfied or dissatisfied with the school that week. There is then the opportunity to make suggestions, complaints, and to give praise… Nashville Classical’s response rate is over 70 percent. A: Ms. Saiyed: About 80 percent of the feedback is positive messages about our teachers! A: Nobody knows you, the scholar, better than your family. We make better decisions about your education when we have the most information available to us – that starts with building a strong relationship with your family.